Found this at Wal-Mart yesterday. I just had to buy it. 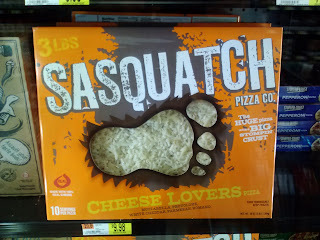 There's even a punch out sasquatch on the back of the box! VIDEO: Has the Loch Ness Monster gone on holiday to London? What Does A Bird See? This is really cool! This is a walkie-talkie exchange from November 2005, at a BFRO outing that took place in Michaux State Forest, Pennsylvania. "In the past five to six years, new research has shown that the number of marine species eating plastics or becoming entangled in them has increased from 270 to almost 700. Sea creatures’ increasing intake of plastic will ultimately have an effect on the food chain, meaning plastic will end up on the dinner plates of humans as it continues to wreak havoc on sea life, according to researchers from the University of Queensland." We are living in very strange times. THE GONZO TRACK OF THE DAY: GALAHAD-"Sleepers"
Badfinger, Joey Molland, The Raz Band, Happy the Man, Live Music, Daevid Allen, Gong, Greil Marcus, Mr Biffo, Roy Weard, Dogwatch, That Legendary Wooden Lion, Hawkwind, and Yes fans had better look out! Joey Molland, the last man standing of Badfinger is on the front cover, with an interview with him about his work with The Raz Band inside. Doug gets all lyrical about Happy the Man, John asks worrying questions about the future of live music, Alan talks about his experiences with Daevid Allen the poet, while we review a book by Greil Marcus and Biffo is uncertain about Crowd Funding. There are radio shows from Strange Fruit and Mack Maloney, the latest installment of the saga of Xtul, and columns from all sorts of folk including Roy Weard, Neil Nixon and the irrepressible Corinna. There is also a collection of more news, reviews, views, interviews and pademelons ouyside zoos(OK, nothing to do with small marsupials who have escaped from captivity, but I got carried away with things that rhymed with OOOOS) than you can shake a stick at. And the best part is IT's ABSOLUTELY FREE!!! and I will add you to the Gonzo Weekly dropbox. The first 69 issues are archived there as well. Information is power chaps, we have to share it! * Jon Downes, the Editor of all these ventures (and several others) is an old hippy of 56 who - together with an infantile orange cat named after a song by Frank Zappa, and two small kittens, one totally coincidentally named after one of the Manson Family, purely because she squeaks, puts it all together from a converted potato shed in a tumbledown cottage deep in rural Devon which he shares with various fish. He is ably assisted by his lovely wife Corinna, his bulldog/boxer Prudence, his elderly mother-in-law, and a motley collection of social malcontents. Plus.. did we mention the infantile orange cat, and the adventurous kittens? ON THIS DAY IN - 1199 - English King Richard I was killed by an arrow at the siege of the castle of Chaluz in France.